Any word on 6z suite?? 6z GFS had 6”-8” and even some 8”+ in the northern burbs. 1”-3” in NYC. but it seems like you have subtract a few inches due to mix precipitation. Last night para GFS had some areas north of I-84 seeing 12”+. Still ways to go with this one. Mt Holly Nws is going with a few inches in my area over to sleet & freezing rain. Mt Holly has not posted a snow map or a briefing package since last night at 6pm. 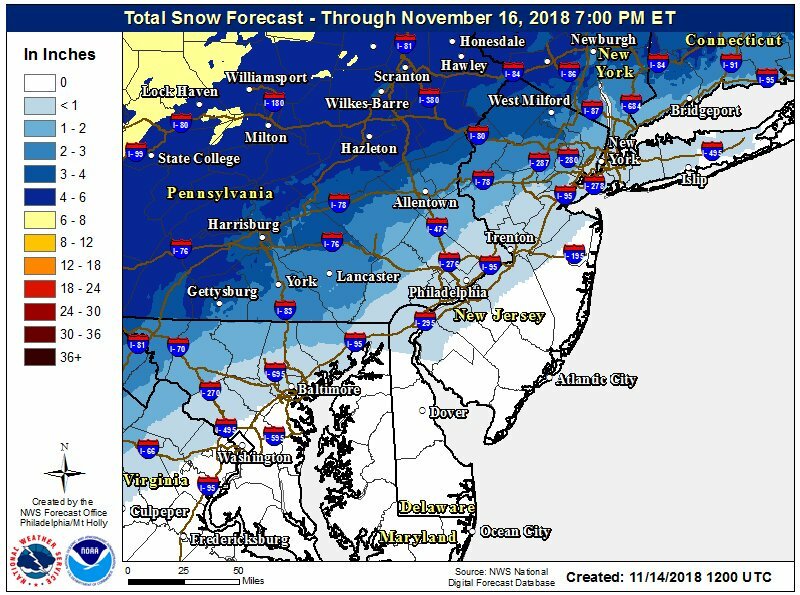 Little unsure why they do not have a snow map when we are within 24 hours of the event. Two camps in the models with this event - RGEM / CMC / HRDPS vs the other models. With the Canadian model outcomes folks to S and E of I 80 and I 287 would get next to nothing in terms of frozen precip. With the other models that are on the snow train be careful of the clown maps that are circulating out there and overstating amounts due to algorithms that calculate all frozen precip using the same ratio. Areas that start as snow will go to sleet and eventually freezing rain and perhaps for an extended period of time. My thinking is we see a coating to perhaps an inch or two near the coast. The Jersey Shore and eastern LI probably won’t see much of anything. Inland areas to the north and west of I 80 and I 287 can see 3 to 6” of snow and sleet before a change to freezing rain or maybe just rain/ drizzle. Areas of NJ between I 78 and I 80 can see 1 to 3” before the change over. Regarding ratios snow is typically between 5:1 and 20:1. Snow with this event will be towards the lower end of that range. Sleet is going to come in at 1:1. FWIW I have personally melted sleet in a rain guage to ascertain this ratio and done so more than once. In addition we could see snow grains or other forms of frozen precip with this event - all at low ratios. The end result is that clown maps using a 10:1 ratio verbatim for this event have and will continue to greatly overstate snow totals. Tat - what is your thinking of precip start times? Trying to coordinate as I will be traveling back to Sussex County from the city in the early/mid afternoon tomorrow. I would imagine Mt. Holly is waiting for the 12Z runs before they put anything out. I think the Poconos and NW NJ get a WWA by this afternoon. For north Jersey I would figure 2 - 3 pm. Road conditions will go downhill fast once precip starts. The map should have been out yesterday. The WWA first thing this morning for those areas. so why wouldn't they have done so already? All the tv and radio forecasts have a changeover to rain by the evening. I honestly don't expect much accumulation on paved surfaces. Well N&W you will likely see mostly frozen precip. What does 12z Nam show?? Thanks...I have no idea where they posts these maps. when I go to http://www.weather.gov/phi/winter I get an old map. Mt. Holly tweeted that most of the area will change to rain from south to north. Areas above I-95 will see more snow/ice before changeover. Areas below I-95 will quickly changeover by afternoon. 12z RGEM came in a lot colder. That’s a big change for it. Now has 6” plus for the Poconos and NW NJ and SE NY north of the Tappan Zee. Seems like a pronounced change to colder with the 12z runs - particularly with the CMC / RGEM. This primarily impacts the colder interior locations. The coast is still not likely to see much from this one - particularly LI and the Jersey Shore. It looks like there will be a big gradient from NW to SE in snow amounts across NYC. There could be a few inches across the north Bronx to very little across southern sections of Brooklyn and Queens. Bill Evans has less an a inch for NYC. 1-3 N&W which all will wash away by late evening. Probably accumulating just on grassy surfaces.